It was tough to decide whether to share a picture of my sweet puppy Kaj or a charming picture of a kitty with a couple of my cousins for the theme "All Creatures Great and Small" (the next edition of Smile For The Camera). In the end I decided to share both pictures because I thought they'd both make you smile! First off, here's a "fishing" picture. Look at that cute kitty eyeing that string of fish! 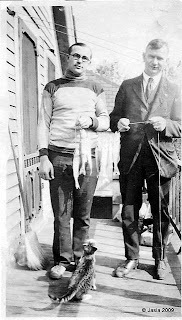 You know what's going through that kitty's mind ;-) I don't know who the kitty belongs to but I can tell you the gents in the picture are my first cousin once removed, Leo Szymkowicz (left), and Bernie Ronowski (right), husband of my grandaunt Josephine Lipa. The photo belongs to my dear cousin ME who graciously gave me permission to share it with you on this blog. Thanks ME! 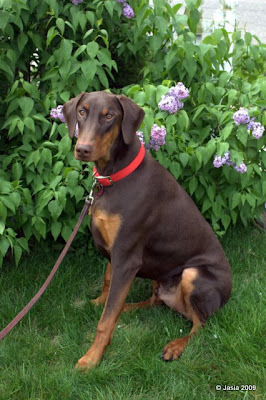 And here is my not-so-little-anymore puppy, Kaj, pictured with my all time favorite flowers of spring... lilacs. Kaj is 9 months old now and weighs 70lbs. He's still full of puppy-energy and makes us laugh every day.